Stamped "Tiffany & Co. Makers," "Sterling Silver," "925-1000," and with a lower case "m," this master salt was put into production in 1902 as indicated by the model number "15251." This was a period when Tiffany made reproduction items or designs inspired by older, especially English Georgian, holloware, and that is the case with this piece. It is round, cauldron shaped, and stands on three pad feet with acanthus leaf sprays where the legs are attached. There is a rolled rim upper edge which has a diameter of 2", while the maximum diameter is 2 1/4". It stands 1 1/2" high and weighs approximately 1.6 T. oz. There is a script "ELB" monogram on the side. It is in very good condition. 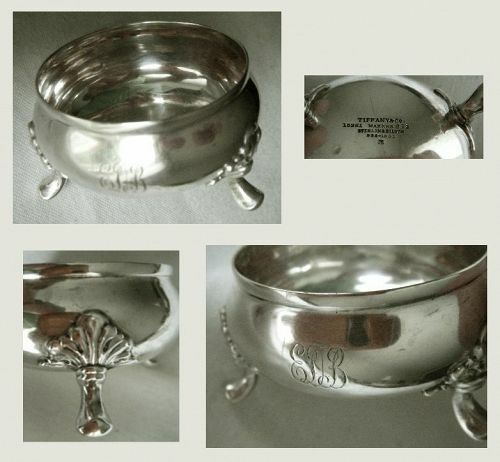 There is light softening of detail from polishing on the leaves and on the monogram. The body is well-shaped and sits evenly. It shows perhaps two pinprick imprints upon close examination, but is free of dents or burrs. The finish is lustrous and absent the pitting that often occurs on the interior of master salts.